For the region, see Prussia (region). Prussia (German: Preußen) is one of the formable countries in Europe and can be formed by Brandenburg, the Teutonic Order, or any country with Prussian, Saxon, or Pomeranian culture (besides Germany and a unified, centralised Holy Roman Empire). It also exists in campaigns started in 1525 or later. Prussia is a powerful military state with strong morale, discipline and tradition; enough to ensure strong generals in commanding large armies, well-trained troops in aforementioned armies and good military rulers. If played correctly, Prussia can dominate Central Europe and the rest of the HRE. Prussia is considered one of the more advanced nations due to the difficult requirements and challenges that must be overcome to form, therefore it is not recommended for beginners. However, once inner quarrels are settled and the homeland is secured it can easily become one of the most entertaining yet still challenging nations. Prussia can also play a decisive role in the League Wars. It is meant for the player to play tall, developing their lands and not waging wars for expansion, since it gives a penalty for the number of owned provinces. Prussia itself was a small kingdom that managed to punch way over its size militarily. Brandenburg, based on the Electors of Brandenburg, having inherited the Duchy of Prussia, crowning themselves King in Prussia in 1701. The last is for any other country with Prussian, Saxon or Pomeranian culture, representing another German country taking the path that Brandenburg did historically. Note that the latter two decisions will elevate the nation to kingdom rank and will consequently make it leave the Holy Roman Empire unless it is an elector. The age of crusading knights is fading fast. There will come a time when we no longer stand to gain by holding on to the trappings of a monastic order. Besides, the Grandmaster would much rather be a Duke... or King. By reforming into a secular state, we can revitalize our administration and gain the respect of our neighbors. Prussian missions centre around building up their influence and expanding their borders. Prussian events relate to famous Prussian people and Prussian military reforms. From a 1444 start, Prussia's strategy is highly dependent on who forms it, what provinces are already owned, and its status vis-a-vis the Holy Roman Empire. If Brandenburg was an elector and formed Prussia then expansion within the Empire is possible without incurring the Emperor's wrath, but due to the the high aggressive expansion earned for taking provinces there, growth may be slow. The player should decide which of three long range paths to pursue; become the Emperor, form Germany, or pursue an independent course. The nearby Lubeck trade node can be a lucrative source of income once enough trade power is seized, and if Prussia makes a concerted effort to increase its naval force limits, wealth from the New World, entering the North Sea trade node can be diverted to increase Lubeck's value further. Germany and the Empire are not strictly exclusive but the requirements to form the one actively undercut the ability to amass authority to accomplish the unification of the other. 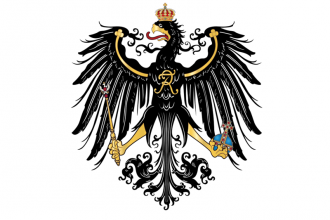 If Brandenburg was no longer an elector, or if formed by another (non-elector) Prince of the Empire, then Prussia will be ejected from the Empire upon gaining Kingdom rank. Further expansion within the Empire is likely to involve the Emperor defending his subjects, and declaring unlawful territory on any provinces taken. Access to the Lubeck trade node will be problematic so the upstream Baltic trade node becomes the next best source of value. This generally leads to war with Sweden (their overlord Denmark), the Livonians, and the Slavic powers to the east.